As exciting as the Internet of Things is, it brings one inescapable downside: More electronic devices means more energy consumption. And even though there have been a handful of IoT products that run on their own little solar panels (see the list below), the vast majority of gadgets still run on rechargeable batteries or a power cord — and either choice means pulling energy from a grid that’s still dominated by fossil fuels. Fortunately for the eco-conscious tech enthusiast, SunPort, a startup located in sun-drenched Albuquerque, New Mexico, has figured out a way to (metaphorically) squeeze solar-powered electrons from any power outlet. The device, which the SunPort team calls a “wearable for power cords”, is an adapter that goes between your plug and the outlet and measures the flow of electricity into your gadget. Then, using the transmutational magic of Solar Renewable Energy Certificates, or S-RECs, SunPort “upgrades” the electricity to solar power. So while the electrons you’re using aren’t always literally generated by solar — they come from whatever source powers the local grid — you can rest assured knowing that somewhere, a solar panel is happily pouring in as much electricity as you’re taking out. This S-REC exchange is an important way to demonstrate demand for solar power. It’s been used for years by large companies who want to boast that they’re “100 percent renewable-powered”, and many power companies give individual renters and homeowners the option to add a few cents per kilowatt-hour to their own electric bills under the same system. SunPort makes that option mobile, so no matter where you plug in, you’re always making your preference for renewable energy known. Of course, you’re also paying for it. 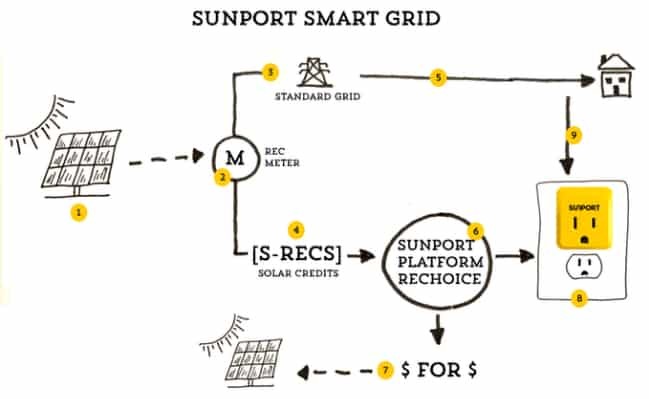 SunPort is offering a year of free S-RECs to customers who preorder the device, but after that it will cost about $20 a year to continue the solar upgrades, depending on how much electricity your SunPort measures. As the company says, “SunPort is about using solar energy as a lifestyle choice” — it’s about making a statement, not saving money. But there is an added benefit: The nonprofit that manages SunPort’s S-REC’s, ReChoice, matches every dollar spent on upgrading solar power with a dollar to help other nonprofits put solar panels on their roofs. So while SunPort users are adding their voices to the growing demand for more solar power, they’re also helping to create new solar installations that can meet that demand in the future. SunPort’s Kickstarter campaign runs through August 27, and the device should begin shipping in March 2016. It connects to a mobile device over Bluetooth Low Energy, and uses that device’s wireless connection to sync up with SunPort’s servers and initiate S-REC trades. A small amount of on-board memory lets it continue to count energy consumption when out of Bluetooth range. Learn more in the video below.